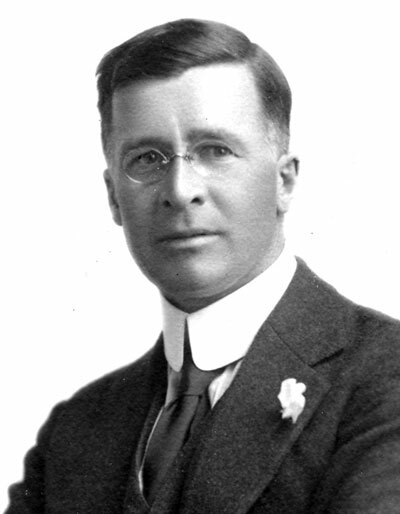 Enderby's first policeman was Basil Gardom, father of former B.C. Lieutenant-Governor Garde Gardom. As a young man Basil homesteaded a parcel of land about where the Deep Creek road leaves the Salmon Arm road. For seven years, he cleared land with blasting powder, dug ditches to drain the fields, and spent summers on road crews to earn enough to continue on the homestead. In the end, he sold it for two hundred dollars, and moved to Enderby. Gardom Lake carries his name. He then enlisted in the South African (or Boer) War. He was elevated to sergeant and served with distinction. He contracted malaria and after his recovery, returned to Enderby. In 1904 he took the job as Provincial Constable for Enderby and area. His job included prosecuting attorney, jailor, and "everybody's uncle" for eighty dollars per month, pretty good wages when one considers that teamsters at the mill were making three dollars a day. It wasn't long after his appointment that Enderby incorporated. The province was reluctant to keep Constable Gardom on their payroll if his policing duties were largely in the new city. 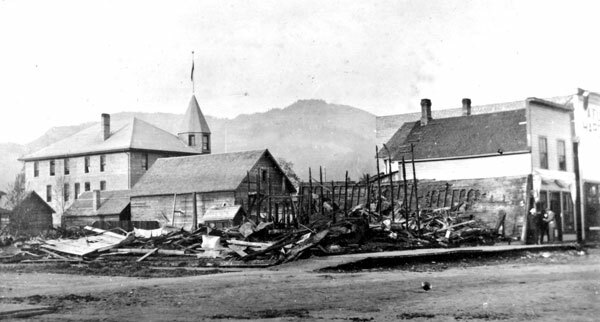 The newly appointed City Clerk, Graham Rosoman, argued that the city was small, the surrounding area large, and there were two Indian Reserves close at hand. He also pointed out that "the important lumber interests which are centred here attract a large floating population of rough character, among whom the deterrent influence of a resident police official is very salutary and necessary.". In the end, the province reduced Basil's salary to fifty dollars per month and expected the city to pick up the remaining part of his wages. The city came through with a mere fifteen dollars on top of the provincial pay. So Basil took a cut in pay to remain in Enderby. One of the first major crimes in Enderby was a shoot-out on Baird Street. Nothing quite enlivens the passions like a love triangle. And so it was that a chap was wounded and Gardom chased the offender down the tracks until he was apprehended. In May 1906, Bill Miner and his gang held up the CPR's westbound Imperial Limited No. 97 at Ducks just east of Kamloops. Armed robbery had the Provincial Police out in force, and Basil Gardom was no exception. Basil left Enderby with about five deputies and headed in the direction of Falkland. They missed out on the capture, but did their duty in covering the area assigned to them. One of Basil's greatest successes as Provincial Constable came in July 1909 when he investigated a suspicious fire at the Dake Jewellery Store on the corner of Belvedere and Cliff. The owners were in Armstrong at the time of the fire, but curiously the safe held no valuables. This fact caused Basil to examine the fire more closely and then proceed to the owners' hotel room where they found the missing jewels under the bed. J.A. Dake was charged with arson. The city council was so impressed with Constable Gardom that they gave him a one hundred dollar honorarium. But Gardom's tenure as policeman in Enderby was in peril even as the city acknowledged his successes. In the early morning of October 29, 1907, Constable Gardom had escorted a Mr. Hines to Sicamous to catch the train to Kamloops where the prisoner was to be committed to trial for murder. There was no holding cell in Sicamous for prisoners, so they waited at the station. The train was eight hours late. At five in the morning, Gardom dozed off and Hines escaped. A few moments later, the good constable was tracking Hines in the mud along the tracks, but lost the trail when Hines went into the bush. They never did find the prisoner. The penalty for losing a prisoner was dismissal. Gardom was suspended and submitted his resignation. Enderby Council refused to accept it and began a serious campaign to reinstate the young man. Petitions were circulated and signatures were obtained from as far away as Vernon and Hullcar. The City Clerk wrote to the superintendent of provincial police in Victoria: "Mr. Gardom is a man of exceptional character and ability; and as an officer, I am sure it would be impossible to replace him." He might also have mentioned that just the year before, Basil had married Miss Helen Munro, had a baby girl, and bought a house on the west side of town. It didn't help. By 1909, Basil's career as a provincial police officer had ended. He sold out and moved to Vancouver, working first as a real estate salesman and later as a farmer championing farmers' rights in the Fraser Valley. Periodically, he returned to Enderby and was given a hero's welcome.